I’ve mentioned many times that I got really lucky in the husband department. Last week highlights that. Steve gets up pretty early (especially for a retired guy) and when the AirPods went on sale early one morning, he immediately ordered me a set before the ship dates moved out to January. They arrived a day early, on the 20th and he didn’t make me wait till Christmas to open them. The promise of the AirPods is many fold. One aspect is that they’re supposed to make pairing much easier. Let’s see if Apple really got rid of this major annoyance. We’ll start with the first experience of opening them up. People seem to be getting disenchanted with Apple in some ways but it’s indisputable that they do packaging like no one else. The AirPods come in a very small plastic case that acts as the charger. I was really surprised at how small it is, It’s about 2 x 1.5 x .75 inches. It looked a lot bigger in the photos I saw ahead of time. Remember the case itself charges the AirPods, so It has a Lightning port on the bottom. The top of the case flips open and closed with the most delightful magnetic click. Seriously, you’ll find yourself opening and closing this obsessively. One of the biggest mistakes you can make with Apple products is to assume that things will be hard. Sometimes having knowledge of how things used to be makes it harder to see the easy way. This happened to me when I opened the AirPods. I immediately pulled them out of the box, and opened Bluetooth on my phone and tried to pair them. I got the dreaded “Pairing Unsuccessful” even though they were in my list of available Bluetooth devices. I did it the hard way, which is the wrong way. I decided to start over. I put them back in the box, and woke up my iPhone. Then I simply opened the box. Immediately a beautiful little screen slid up from the bottom with a picture of the AirPods in their case and one button that said Connect. I tapped it. 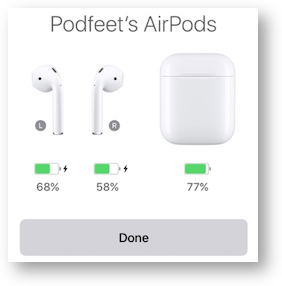 Instantly the screen changed to Podfeet’s AirPods and it showed me a picture of the two AirPods with their two different battery charges and the case showing it’s charge, and a done button. So, yeah, open the box, tap two buttons, you’re done. Crazy easy. Put them in your ears and when they detect they’re in place, they give you a lovely chime in your ears. The second part of the AirPods’ magic is that pairing is synced through iCloud. This means that any device you have that’s logged into your iCloud is automatically paired. I whipped open my iPad Pro, tapped on Bluetooth, tapped on Podfeet’s AirPods, and boom, I was connected. No pairing. Then I went to my MacBook Pro, saw Podfeet’s AirPods under the Bluetooth icon in my menu bar, selected connect … and nuthin’. Tried again. And again. And again, I complained to Pat Dengler and Steven Goetz on Telegram. Tried again. Grrr. Threatened to call AppleCare. Opened iCloud in system prefs. It suggested I log in, which it does ALL THE LIVE LONG DAY. I logged in yet again, but still no joy. So I rebooted the Mac and suddenly I was able to connect to my AirPods. I titled this article “Apple AirPods – Bluetooth With Less Fiddling?” because I think having to reboot my Mac is a LOT more fiddling than I wanted. They work great now, but still that wasn’t exactly a joyful experience. 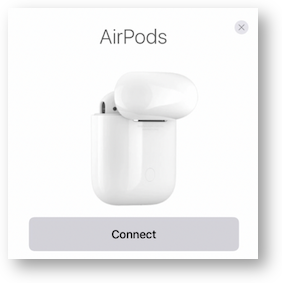 What if you have an Android Phone or a Windows machine or even another iOS device not logged into your iCloud account and you want to pair your AirPods to them? Turns out there’s a nearly invisible button on the back of the AirPods case that will help you with this. I only knew it was there because I read about it on Apple’s setup page and it still took me a minute to find it! It’s a round flush button in the same white as the case. If you open the lid with the AirPods in the case and press and hold the setup button, the status light that’s normally green to show your AirPods are charged charged and ready will change to white. Once it’s white, you can pair another device. I was able to pair the AirPods to my Kangaroo Windows PC and I paired them with Steve’s iPhone and it worked easily, if a little bit old school. I find the AirPods to be extremely comfortable, almost to the level of forgetting I have them in my ears. I took them on a walk and a run and they stayed in my ears perfectly. However, I’m one of the lucky ones who has ears made for earbuds. We had heard from early reviewers that these stayed in difficult ears much better than the traditional Apple EarPods, so Steve was cautiously optimistic that maybe he could use them too. Regular earbuds simply fall right out of his ears. Sadly, while the AirPods don’t fall out of his ears, they also don’t go into his ears. Unless he pushes on them with his fingers, the sound isn’t at all good. If you’re a NosillaCastaway, you know how Allison feels about music. So we both thought it would be best that I review her new Apple AirPods from a music perspective. 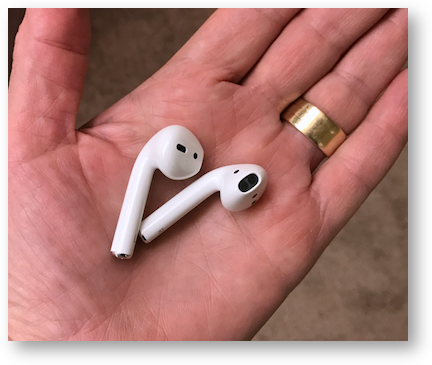 To perform this review I compared the AirPods’ music reproduction quality against six other listening devices. 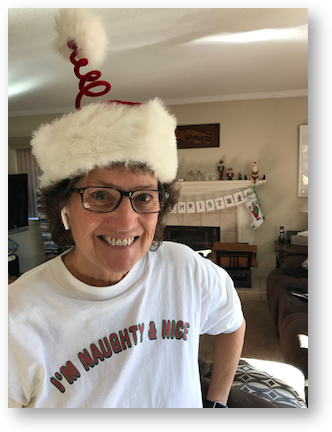 I tested two sets of wired, over-the-ear headphones: the Sennheiser HD 203’s that I use for monitoring the live Nosillacast, and the Bose TP-1As that Allison uses when she records and monitors the NosillaCast. I also listened with two sets of wired earbud-style headphones: the Sennheiser Sport that goes around behind your head, and Apple’s own wired Earpods. And lastly I compared the AirPods to two sets of Bluetooth headphones: the Jabra Sport Wireless+ that hook on your ears (these are the ones I use for exercise) and the Trekz AfterShokz bone-conducting headphones that Bart and Terry told us about. All music was played as MP3s on an iPhone 7 Plus. For wired headphones, I used the lightning-to-audio jack dongle sold by Apple. I adjusted the volume of the iPhone so that all devices played each song at roughly the same volume. Keep in mind that assessment of sound quality is very subjective, so your mileage may vary. Let me start by acknowledging a few things. It might not be fair to compare the sound quality of wired, headphone cans against wireless earbuds, but I wanted to give the AirPods a challenge. Also, these various listening devices are clearly designed for different use cases, but I wanted a large sample set to compare the AirPods against so I used everything that was immediately available to me. Finally, some of the listening devices I used are no longer being sold in their current model, but for those, newer models are available. So what were the results? First, I expected the AirPods’ sound quality would be similar to Apple’s wired EarPods, and sure enough I could barely discern any differences in sound quality. But what surprised me is how good the AirPods (and EarPods) sounded against their strongest competitor, the Bose TP-1A over-ear headphones. Although the TP-1A’s are not Bose’s highest end headphones, they do produce very good sound quality across a wide range of music. The AirPods produce a very crisp sound with no hints of compression and remarkably good sound across the spectrum, from low to high. Only in the bass department did the Bose headphones outperform the AirPods, but not by very much. Music quality from all of the other listening devices I tried was considerably degraded from that of the AirPods, in various ways. The Sennheiser Sports earbuds and the Sennheiser over-ear headphones, were the next best sounding audio devices, with the former suffering from a slight tinny sound and the latter having a muddied-sounding bass. The Trekz bone-conduction headphones had some compression artifacts and the vibration of the bass on my jawbone became a bit annoying at times. And finally the audio quality of the Jabra Sport headphones was simply awful; the music sounded highly compressed, very tinny and devoid of bass. Ironically these are the headphones I use when I run, and they are fine for the podcasts I listen to, but definitely not for music. The bottom line is that I would definitely wear AirPods to listen to music, they produce great sound quality across a wide range of music … if only they would stay in my ears. Thanks, Steve – I thought they sound great but no one would believe me. If you’ve used Bluetooth headphones before, you know a big problem can be getting the signal to travel from your phone through your body to your headphones. Bart likes to point out that we’re just bags of water, and Bluetooth doesn’t like passing through water. I tested the AirPods in my Spi-Belt (which is a thin nylon bag that goes around your waist). I tried the phone in the front and in the back and no matter how I moved I could not get the signal to break up. I suspect that because there’s two headphones both receiving Bluetooth, you might have better success getting a signal than with other headphones where only one does the receiving. There’s one feature of the AirPods that is a pretty big downside to me. There are no buttons on the AirPods, so you have to use Siri to interact with them. As we all know, Siri insists on having an Internet connection to do pretty much anything. You can simply be asking her to dial a phone number that is stored locally on your iPhone and she still has to have Internet. This can create some problems with using Siri on AirPods. I like to fast forward through ads in podcasts if I’ve heard them before. It’s pretty easy to do on AirPods, you simply double tap on one of them, wait for the Siri ready noise, and say “fast forward 38 seconds”. She’ll come back and say, “Ok, fast forwarding 38 seconds”. That’s great! Unless you don’t have an Internet connection in which case she does nothing at all. I walk next to the Pacific Ocean and it turns out it’s incredibly difficult to provide cell service next to gigantic bodies of water. Some of my path has Internet but some of it doesn’t. The intermittent success of this is really irritating. I do like that I can be specific about how far forward or back I want to go, but having it not work sometimes is a giant waste of time. Now I was going to blame Apple for something else here. When I asked Siri to fast forward (and I had an Internet connection) she said she was going to do it but didn’t restart the podcast playing. That was idiotic! But when I got home, I tested on some other apps like Music and the Apple podcast app, and they DID start playing. Turns out the PocketCasts app is to blame. You can be sure I’ll be sending them some feedback. Sure glad I tested before firing off the nastygram to Apple that I had written. UPDATE: I’m not sure what happened on that first day, but Pocketcasts absolutely does start playing the audio again after a fast forward or reverse. No nastygrams written at all! Ok, let’s keep going. What if I need to turn the volume up? Same problem, only Siri to do this. Skip to the next item on my playlist? Nope. Not if there’s no Internet. If I were able to program the controls, I would make double-tap go forward in a podcast whatever I’ve told my app is my default, and maybe triple-tap to go back. But nooooo. You can control the audio using your paired device, so if you’re on a plane (or the beach) you can still fast forward and rewind and change volume by hand, but if you’re exercising it’s kind of a pain to do It that way. One thing is really cool though. To pause audio, you simply remove one of the AirPods from your ear. Super easy. I especially like this because it could be a useful cue to someone who tries to talk to you that now you’re listening. Very good design. Another nice feature is that you can use just one AirPod at a time, and charge the other one in the case. With a promise of 25 hours of battery life from the case, you could use the AirPods in series and get double that. Pretty cool innovation. It’s important to also note that if you’re listening to stereo music, the single AirPod will combine both stereo tracks into a mono track so you don’t lose half your music. You can change the behavior of double-tap on AirPods but not to anything useful. You can change it to play/pause (which is harder than taking one AirPod out in my opinion) or make double-tapping do nothing at all. Gee, that’s super useful. I suppose you could prank someone and make them think their AirPods were broken! The controls to change this behavior are in a weird place. On your iOS device, open up Bluetooth, tap on the “I” next to your AirPods, and then you get the controls. Along with the usual disconnect and forget this device, you can change their name and mess up double-tap as I described. You can also turn off automatic ear detection. This is really dumb because it disables the play/pause when you remove one from your ear, and the headphones will still play music even when they’re not in your ear! Both AirPods have a microphone and for some reason Apple thought it would be useful for you to make one of them stop working. Which would also be dumb. So your big control set is to disable all of the good features, but not change the behavior to something else. How about double-tap to fast forward the amount set in your podcast app and triple tap to go back…without needing an Internet connection? Oh, I said that already, didn’t I? On my long walks I often like to chat on the phone to Pat or Lindsay. With my Sennheiser headphones they complained of wind noise. Then I got the Smartbean adapter I’ve talked a lot about that gives Bluetooth to any wired headphones. It didn’t occur to me that it would solve the wind problem but it did. I keep the Smartbean clipped under my shirt, and it bypasses the mic on the headphones and uses its own mic. That means I have zero wind noise because my shirt acts as a perfect windscreen. I tested the AirPods with a call to Lindsay and she noticed something really interesting. She said that if I was not talking, she could hear the wind, my footsteps, and cars driving by were pretty loud. But as soon as I started talking, she very clearly heard mostly me and hardly any background noise. Overall she said they sounded great, and on my end her audio was perfect. One of the things people find with Bluetooth is that there’s a lot of latency which means they’re bad as real-time monitors. Dave Hamilton asked me to test the AirPods with YouTube to see if there’s any detectable latency. I’m not nearly as sensitive to this as Dave is but I agreed to give them a good test. I chose a video by Jenny Nicholson, who does these hilarious videos about super hero movies. I think my favorite is the one she did about Suicide Squad. It was funny before I saw the movie and afterwards it’s priceless. Anyway I chose Jenny’s video because she’s funny but also because she articulates clearly, and she does closeups of her face so I could really watch her lips closely against her voice. I’m happy to say that there was no lag whatsoever. But I didn’t think that was enough of a test. Steve and I got on a Skype call with me on my iPad and him on his iMac. I made him say “beep beep beep” to me a bunch of times. Partly so I could be sure to see the beginning of the words for the lag question but I have to admit part of it was just because it was funny to watch him say it. Again, not a discernible split second of lag. I don’t know how Apple conquered this but it sure seems they’ve done it. As much as I liked opening and closing the lid of the AirPods case to see that little battery indicator slide up, I wanted to know what a blind person would hear if VoiceOver was turned on. I have to say it didn’t work well at all. The message about battery didn’t come up for more than 15 seconds, and when it did, it was just a little chirp, not reading anything on screen. I slid my finger across the message and it would read to me but I was never able to get it to go away. I closed the case, put the AirPods in my ears, and still that message stayed up on screen. I swept right, left, up down, one, two and then three finger swipes, I tapped I poked and prodded but I never got that screen to go away until I put the AirPods back in the case and closed it. It’s possible that I just don’t know the right gesture so I’d really like to have one of my blind friends test this for us and let us know if you can figure out how to get it to go away. When I walk somewhere with my traditional headphones in, I can rip them off and just toss them wherever I am. I could get in the car and throw them on the seat, I could toss them on the counter when I get in the kitchen. But with AirPods, you have to open the case with two hands (unless you’re an accomplished Zippo Lighter user I suppose) and carefully slide each pod into the correct hole. Don’t put both in your hand and then open the case, because you’ll waste time trying to figure out which one is which. You do get the satisfying closure of the case, and it’s a lot easier to put away than a pair of wired or even Bluetooth headphones. The case is so compact I’m really delighted to carry that instead of my old headphones. But I fear that that little extra time to put them in the case might make us just set them down somewhere. And that’s when we’ll lose them. I wore them into the Apple Store the first day (yes, to see if anyone would notice) and a sales guy started talking to me. I took one out and began to chat, then wanted to look at something on a shelf and I almost set the one AirPod down. I had to catch myself and hang onto it. I also worry about leaving them around at home. Our cat Ada is like a raccoon, she has stolen many earrings and other shiny things, so she will absolutely steal one of these if I’m not super careful. As much as I enjoy opening and closing the AirPods case, it’s not as easy to remove them as I would like. I have medium-length fingernails and it actually can take me 2-3 tries to pull them out. I suspect that I’ll find a way to do it reliably but right now it’s a bit of trial and error. They could stick out just a tiny smidge higher and I’d be able to grab them more easily. I even tried shaking them out but they’re magnetically held in place and they won’t fall out. My goal is to wear the AirPods when I exercise so I wondered whether they’re water resistant. I wasn’t willing to submerge mine, even for science, but luckily EverythingApplePro was willing to test theirs. They dropped them from higher and higher heights, up to 10 feet, in and out of the case. The case got pretty scuffed up but the AirPods continued to work and showed no signs of having been dropped. Then they went much further than sweat. They decided to run them through the washing machine, including soap and then ran them through the dryer! Then they submerged them under a foot of water for five minutes. These folks are really dedicated to science. After all of this torture, the AirPods worked perfectly with no damage whatsoever. So yeah, I think I can sweat in them! From my twenty four hours of testing, I think the Apple AirPods are pretty great. I like the fit and feel, the music sound quality is great, the voice audio quality to people I’m calling is great, and they work well for exercise. Pairing across your devices is the dream we’ve all been waiting for, assuming you don’t have the weird problem I had with my Mac. If you’re blind, I’d sure test them out before buying. I really truly hate that Siri requires an Internet connection and she’s the only way we can control things like fast forward, rewind and skip track, but I think I can get used to it for all of the other advantages. Oh yeah, and there’s no wires which is awesome. Can you control playback via the iPhone? For example, if you’re in an airplane and want to listen to a podcast, but then you change your mind and decide to listen to a different one. Without an internet connection, are the AirPods useless? Yes, you can. I did have that in the review but took it out because it seemed obvious. Evidently not, so I’ll put it back! Thanks for the informative hands-on experience. LOL – he has tested EVERY speaker he’s used since the first day of college with that song. It’s his trademark. Still, this “system” sounds like ( ha ) an engineering kludge from one of Dante’s Circles in Hades. I nominate level 8, “When you arrive, you will want to put your hands over your ears . . ” possibly to keep your Apple AirPods from falling out. Sorry, but I couldn’t find where “design to work only sometimes” is a specific sin . . . Think briefly about the click-wheel iPods, the innovation that moved “modern” Apple toward extreme profitability. They were local devices. Rip music, move to the iPod to play on the go. Later, Apple added the ability to buy music and store on your own computer, and to download podcasts, and other media. At no time was a “click wheel iPod” dysfunctional because it couldn’t connect live to a network. The users’s content was useful, mobile, and under the user’s control, wherever, whenever. The click wheel worked, even by feel buried in a winter coat on a long, cold, walk. By contrast, AirPods REQUIRE a live connection to the network for the user to control as intended. They pair by linking to a proprietary (and not famously reliable internet service, iCloud). AirPods: easy to lose, don’t adjust to different ears, won’t fit in some, and simply fall out of others. Apple having set the removal of 3.5 mm jacks in motion, hopefully, whatever wireless earphone system becomes dominant will be “ear friendly” and work “local only” and, especially, won’t need a proprietary connection. Be nice if they could be worn, and used, comfortably under a knitted woolen winter hat, something the AirPods with their “remove from ear to pause play” wouldn’t do so well ?? The old FedEx “absolutely, positively” test should be the minimum standard for headphones / earbuds. Fits, doesn’t fall out, works as intended wherever and whenever, no network required. Thanks Allison!!! Your review was most compressive and very informative and helpful in making my decision that I would like to get a pair of them I have several Blue Tooth Headphones but I have never used them. If I buy the Apple Airpods, I am sure to sue them and most likely will enjoy using them. I think you answered my question about using the phone with them. Very interesting and thorough review, Allison! Thanks! You can’t make a phone call without a phone connection, and your phone connection is also your internet connection. Garry says above you can’t make a phone call without an Internet connection. On MY phone and every earlier smartphone I’ve had voice and data are separate. T-mobile slipped in a VOIP like use of MY WiFi (and still counts the minutes, of course they do) but that can be turned off. I travel in rural areas where data doesn’t work but voice calls do. Here is a link to Macworlds review that mostly mimics Allisons review. The review includes a video showing how stable they are in the ear. Sorry got distracted and forgot the Macworld article link. I was tired asking for people on how to Pair my Airpods. Here is where I got all my questions answered. The best facilitator I ever met. I’m so glad it helped, Soham. Your note made me smile this morning. >I like to fast forward through ads in podcasts if I’ve heard them before. It’s pretty easy to do on AirPods, >you simply double tap on one of them, wait for the Siri ready noise, and say “fast forward 38 seconds”. It’s easy to do in a quiet environment. I work in a cubicle farm with people talking all around me all day, so siri doesn’t work for me. I’m hoping that they’ll give us the option to assign double-tap on right airpod to the “fast forward X seconds” function. iKomrad – I haven’t found the Siri control to be that useful over time either. My morning run is along thee beach and the cell data access is dodgy there, so Siri doesn’t work. Now I use the Apple Watch instead. One swipe from right to left during a workout and I’m at the controls. I may have a solution to the “they almost, but don’t quite, fit/stay in the ear” problem. I read online that some people have successfully used Sugru (a weird, moldable rubber like substance) and stuck a bit of it on the part of the EarPod that fits in your ear, which adds just enough extra material to make the EarPod fit better in your ear and seal well. It’s cheap and is not permanent — it can be easily removed. I thought about trying it, but decided on a more low-tech solution: I just cut a small strip of gaffer’s tape and stuck it to the top of each EarPod. Sure it looks pretty ghetto, but it does a GREAT job of keeping the AirPods nicely sealed in my ears. Best part is, it doesn’t interfere with storing them in the case! I bow to your nerdliness.